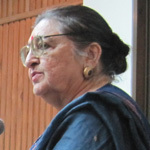 Dhamija, Jasleen began work with the Government of India in 1954, focussing on the revival of traditional crafts, community development and women’s employment. She then worked with the United Nations Development Programme in Iran on the first project on Rural Non Farm Employment to support the Land Reform. Jasleen has been advisor to many governments on applied art and multi-cultural creative expression. She has also taught in many universities and lectured around the world. She was visiting fellow at Canberra School of Arts, Canberra, Wollongong University and Sydney School of Art. She has organised major exhibitions including Power Cloths of the Commonwealth at the Commonwealth Games in Melbourne and New Delhi. She was appointed President of Jury for Award to the Finest Textile Designers and Weavers for their Creativity in Asia and Co-Chairperson for the Handloom Development Working Group to evolve a development programme for a million handloom weavers.